1.25 Zetec S engine not in line-up. Though handling is good, trim level can be very basic and ordinary compared to Toyota Yaris, Honda Jazz, VW Polo or even Citroen C3. 1.4 Zetec S lacks sparkle. Even 1.4 diesel seems less enthusiastic in the Fiesta than in the Citroen C3 and not to the standard set by the Yaris D-4D. Make sure drain holes in the bottoms of the front doors are properly stamped out of the pressing and are free flowing. Pollen filter seals may not be correctly fitted and lead to flooding of passenger footwell. In 2003, briefly fitted with 1.3 ohv Endura E engine instead of the 1.3 ohc. Avoid this engine. On the thankfully rare ancient 1.3 Endura E pushrod engine, a faulty speed sensor may result in over-revving when dipping the clutch. Have been complaints about ECU light coming on and losing power, and of instrument cluster earthing problems. I.4TDCIs suffered bout of broken fuel pipes in Spring 2004 and shortage of replacement parts. Possible heater problem with 1.25 Flights. 1.4 litre 'Durashift' automatied clutch manuals prone to losing 'drive'. (1.6 4-speed torque converter autos okay.) Water ingress to engine compartment causes damage to plugs, leads and coil pack. PSA 1.6 TDCI 92 engine seems to be prone to oil leaks. End of plastic dipstick of 1.6 TDCI engine can break and drop into sump requiring removal of sump to retrieve it. 'Whirring whine' from 1.4TDCI may be failing timing belt tensioner, which is a roller bearing device like the idler pulley, but with a reddish rubber/nylon damper. Gates cambelt kits include this part. Wise also to replace waterpump which it driven by the timing belt. ASM Module and gear actuators of 1.4 'Durashift' automated manual prone to failure after 4 - 5 years and replacement likely to cost £1,500. Fluid from screenwasher pipes can leak onto the top of the block and if the car is not used a lot evaporating it off the fluid can eventually rust the spark plugs. Front coil spring failure became extremely common by 2008/2009 on cars as young as 42 months old. Apparent clutch failure may be due to nothing more than a spring washer on the shaft behind the clutch pedal coming loose. This pushes on. Ford dealers usually have the part in stock and it's a quick fix. Report of seat tilt mechanism on Style 3-door models repeatedly failing. Bleached painted door handles became a common problem by 2009. Widespread problem with EAC (electronic accelerator control) failures on 1.25 and 1.4 petrol engines. Diagnostics identify a a throttle position sensor ratio error as the problem. May be due to corrosion in one of the connectors. Updated throttle bodies on back order in Novemmber 2009, not expected until January 2010. Quickclear windscreen elements can have a fairly short life. Complaint that thermostat housing of 1.6 diesel is made of plastic that can warp and leak. 10-8-2011: On 1.6 TDCI, reports of oil feed pipe blockages to the turbo resulting in repeated failed turbos. 5-12-2011: One report of failed ABS module on a 2006 Fiesta Studio. 27-5-2013: Any 1.4 Durashift that has not been expensively repaired could be close to the end of its economic life because reapiring a Durashift with new actuator and clutch can cost £1,200 - £1,600. 31-5-2013: Injector seal failures on 1.4TDCIs seem to be quite common. The Siemens SID804 or SID802 common rail injection system is the system at fault. 11-11-2013: Report of instrument panel fault may be related to speed sensor oil seal failure. Symptoms: warning lights stuck on for ABS, handbrake, engine, speedo inoperative; rev counter works, fuel gauge, and low fuel warning ok engine temp ok mileometer static before disappearing, trip counting inoperative, miles to refuel appears (counting) before disappearing. 19-11-2013: Durashift automated manual motors of 2003 Fiesta failed at 24k miles in 2006 costing £440, then again in 2013 at 52,000 miles. 29-8-2014: On 2004 Fiesta 1.4TDCI, ancillary belt came off and wrapped itself around timing belt causing the timing belt to jump teeth. Important with this engine to chech the cheap ancillary belt ands replace as necessary. 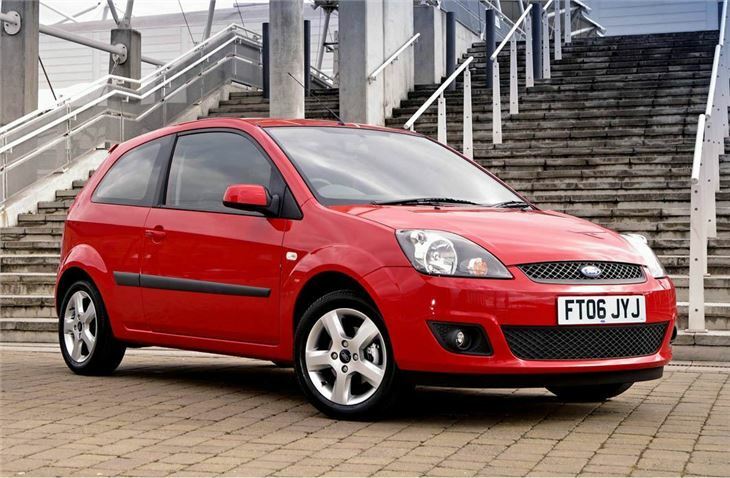 28-1-2016: Report of problems with 2006 Fiesta 1.4TDCI: Battery light came on. After a drive it went off. Next day it came back on. After £200 spent, turns out there was a wiring issue. The day after that no problems. Following day the check engine light, ABS light came on and the accelerator would nott work. Garage now says at least £1,500 for a new management system. 26-6-2017: Sticking speedometer reported in 2006 Ford Fiesta. Occurs in hot weather. Dashboard cluster had been replaced in 2015 due to gradual failure of indictor lights and the speedometer needle sticking and under-reading or over-reading. Now, during the recent humid spell, when the cabin of the car becomes very hot, the speedometer begins to stick again and move in a staccato manner, instead of making a smooth sweeping motion. Once above 40mph it sticks, causing the speedo to then misread. This does not happen in cooler weather, which suggest to me that an internal part is expanding and jamming the needle in its housing. 13-12-2017: Report of main bearings of 1.4 petrol engine of 2006 Ford Fiesta failing at 80,000 miles despite regular servicing. September 2002: Airbag warning light may not function. Also TSB issued over ECU problem with TDCI models, solved by reprogramming. 7/3/2003: The weld seam securing the brake unit mounting plate to the rear axle may not be to specification on a small number of vehicles. Check the production date code and replace the axle where necessary. March 2006: recall notice or TSB issued by Ford to owners of 2005 model 1.25 models stating that the push rod from the clutch pedal can disconnect resulting in the drive from the engine not disengaging the gearbox when the clutch pedal is depressed. This sometimes took a long time to feed through as some of the affected cars were not attended to until 2008.